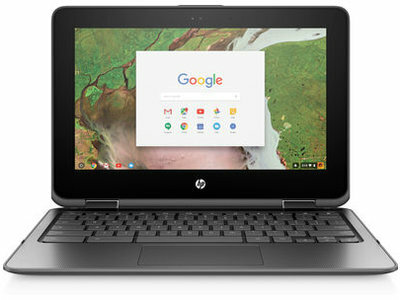 Enjoy shopping online, watching movies or working on a school project on this HP Chromebook x360 11.6" touch-screen laptop. The portable computer features Bluetooth® and wireless technologies to enable use without plugging in a bunch of cables, and the 4GB of memory, 32GB eMMC and Chrome OS help you get more done during a busy day. 11.6" touch screen lets you navigate the features with your finger. 1366 x 768 resolution offers brilliant HD graphics. Powered by Intel Celeron N3350 processor. Multitask with confidence. 32GB eMMC ensure storage space for your files. Features Wireless-AC (802.11a/b/g/n/ac) technology connects to the Internet without cords or cables. microSD™ card reader accepts additional storage cards (cards sold separately). Features 4 USB 3.1 ports for fast data sharing. Front-facing wide vision HD webcam with integrated dual-array digital microphones for video chatting. HD audio with stereo speakers to blast your tunes. Features Bluetooth wireless for fast, short-range data transfers. Full-size, island-style keyboard with a Touchpad that supports multi-touch gestures. Stays powered for up to 11 hours and 30 minutes. Battery life will vary depending on the product configuration, product model, applications loaded on the product, power management setting of the product, and the product features used by the customer. As with all batteries, the maximum capacity of this battery will decrease with time and usage. Corning® Gorilla® Glass stands up to all the daily abuse a touch screen takes. From gripping to swiping—help reduce accidental damage with strong, more durable protection than most displays. The millions of Android apps you know and love on your phone and tablet can now run on your Chrome device without compromising their speed, simplicity, or security. Your own virtual hard drive is available anywhere the Internet is accessible. Conveniently store up to 100GB of content for 2-years with Google Drive access. Innovatively engineered to rotate 360º so that you can use your device in four positions. Work in laptop position, watch in reverse position, play in tent position, and go in tablet position. 1 Testing conducted by HP using Google Chrome OS power_LoadTest. Battery life will vary and the maximum capacity of the battery will naturally decrease with time and usage. See http://www.chromium.org/chromium-os/testing/power-testing for test details. 4 Burst frequency performance varies depending on hardware, software and overall system configuration. 11 EPEAT® registered where applicable. EPEAT registration varies by country. See www.epeat.net for registration status by country. 12 Internet access required and not included. Availability of public wireless access points limited. 13 Call 1.877.232.8009 or www.hp.com/go/carepack-services for more information on Care Packs available after 90 days.